With some trepidation, we leave David; Panama's second city. 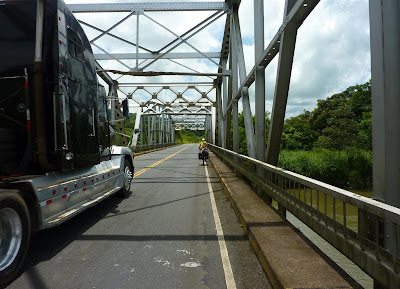 The next 450kms (280 miles) of our journey will take us along the notorious Pan-American highway – there are simply no other roads across Panama. Reports from previous cyclists talk of the dizzying heat, the noisy monotonous traffic, narrow sections of nasty pot-holed road surface and above all, the chaotic driving - all horn's blaring as you are physically driven off the road. This is the kind of riding we try to avoid when we can by taking the more scenic, less trafficked back roads. This is hamster-wheel cycle-touring - just turning the pedals and getting the job done. In addition to the heat and traffic, the land refuses to lie flat and it's a never ending sequence of short frustrating ups and downs that drain energy and rhythm. We overnight in San Felix that provides a cheaper alternative to the tourist beaches of Las Lucas. Next morning we rise at 5am to do battle once more and slip into the routine we repeat for the next few days. Dawn start, hamster wheel dash, traffic, heat, rolling terrain and endless blaring horns. Towards the end of the day, skies darken and the heat of the day is beaten back by an avalanche of rain that often arrives, then stops as if by the flick of a switch. Incredibly there are no hotels on the Pan-am highway outside of major towns. We cover 125kms from San Felix to Santiago and feel char-broiled by the time we arrive after 10 hours in the saddle. 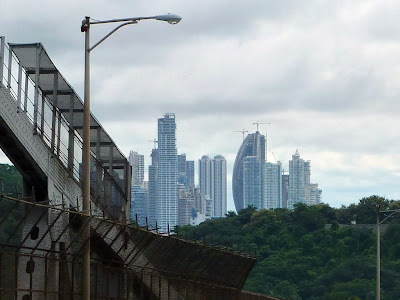 Fortunately, as we get nearer Panama City there are more and more towns and we are able to drop short in Aguadulce the next day rather than tackle another 125kms to Penonome in the heat. The short day gives us time feed and water ourselves and to give the bikes some much needed attention. We had planned to climb into the mountains to El Valle which is described as a quaint little mountain getaway with serene walks and fine views. We're a bit surprised when we start seeing giant billboards advertising the place every mile or so for 20 miles before the turn off. Me thinks it is not so undiscovered and pristine as they had lead us to believe. Prices are also rising fast as we get closer as we find out at a small dingy hotel above a petrol station asking $33 for a room nothing like Guacamaya. Rooms 2kms off the highway by the surf beaches are going for $65 – we paid less than that is San Francisco, California! We ride on looking for better deals, when we hit the biggest storm so far! It's torrential! Massive raindrop sting the face and eyes and we are struggling to see anything through a wall of water. Within minutes our front tyres are pushing a bow wave before us and the roads are 6 inches deep and flowing fast. Even car drivers are starting to pull over as water logged windscreens cannot be cleared fast enough. Obstacles and pot holes are invisible beneath the moving liquid surface; a point I prove in spectacular fashion, by pulling off the road and hitting a submerged kerbstone. The bike and I land in a river of water a foot deep and my bags fly off the bike and float away. Skin is removed from knees and elbows and worst of all my handlebar bag flies open and scoops us a giant gob of water. Luckily my passport and maps also float! My camera, Mp3 player and wallet do not. 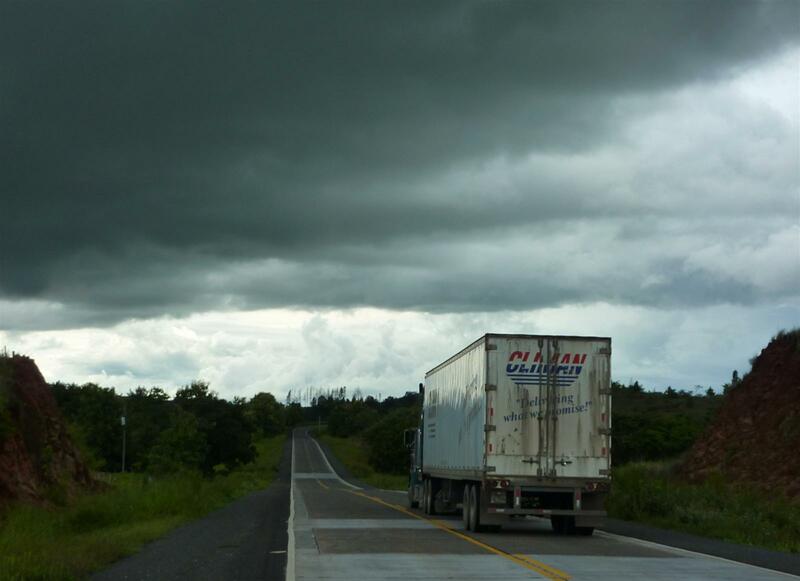 The storm is in for the day and we get a very large slice of luck on hearing there is a hotel just 200m up the road. We trudge up to the gate and our hearts sink as it's an amazing old house, lovingly renovated; obviously by a ex-pat. This is going to cost us but we have no choice as the roads are chaos and it's waaaaay too dangerous to carry on. Apparently we've passed some invisible line in Panama where it all becomes retirement places and condos by the sea and it costs serious money! We inspect the damage left by the river in my handlebar bag and somehow the camera and MP3 player have survived. My passport looks a little more colourful now where all the inks have run but it's still intact. Finally we climb over the last set of hills past 'Capira' and reach the outskirts of Panama City. 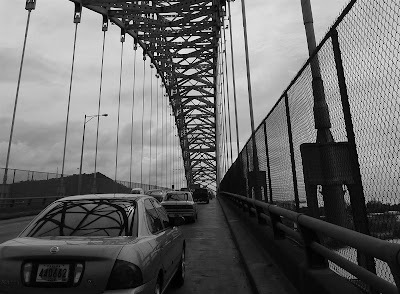 It's the final mad dash as traffic reaches attack speed down the hill as it filters towards the 'Bridge of the Americas' over the Pacific entrance to the Panama Canal. Officially we are not allowed to cycle on the bridge, so we run the gauntlet of traffic fully expecting to be stopped by the police. What happens after that we don't know, but as it turns out, we never find out. For once I can understand why cyclists are discouraged from crossing. The bridge is narrow, there is nowhere to go to get away from traffic, the edge of the road is strewn with debris, traffic moves at blistering speed and the whole thing shakes under the weight of it all.